This extremely remote cabin and approximately 120 acres in northwestern Price County that must be see to believe! The land has an excellent trail system allowing easy access to all of the property, there are three food plots staggered throughout the land and Pine Creek touches the property in 2 different locations. 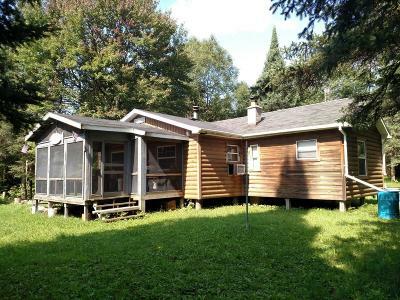 The large main cabin is 24x24 with a 13x13 addition and a nice screened in front porch. In addition to the main cabin there is a 16x24 bunk house and 12x16 shower/generator house both with woodstoves and LP heater in the bunk house. The main cabin has both a woodstove and fuel oil stove. This isolated outpost is set far from any roads and is accessed by ATV through County Forest with permitted access. The acreage is heavily wooded and wood be a great camp for deer, bear and grouse hunting! © 2019 North Woods MLS. All rights reserved. Information deemed to be reliable but not guaranteed. The data relating to real estate for sale on this website comes from North Woods MLS and the Broker Reciprocity Program.sm. Real estate listings held by brokerage firms other than RE/MAX New Horizon Realty, LLC are marked with the BR logo and detailed information about them includes the name of the listing brokers. Listing broker has attempted to offer accurate data, but buyers are advised to confirm all items. Information last updated on 2019-04-24.